The on-again off-again project that is the Pentax digital version of their popular and inexpensive 645 medium format film camera, is on again. First announced over five years ago, this camera was displayed in advanced prototype form in 2006, prompting fairly detailed coverage in the press. More recently cancelled, the 645D, as it is tentatively known, was revived again last March, according to this press release (in Japanese). What do we know about this camera? First, we have a more definitive release date than at any time in the past, spring of 2010, according to president of Pentax Imaging (USA) Ned Bunnell. He has been quiet about this on his blog, but answered questions at the recent launch of the Pentax K-x, an entry-level APS-C camera (according to PDN Gear Guide and Mark Roberts). 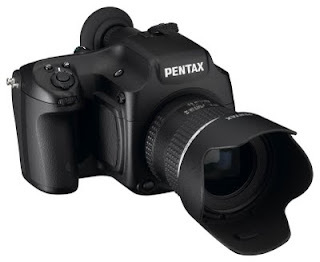 Along with the camera, a new "digital series" lens, the smc PENTAX-D FA645 55mm F2.8, will be available. This points to an important fact: the 645D, like the Hasselblad H3DII-50, will be using a 48×36mm sensor that is significantly smaller than the size of 645 film. Thus the smc FA 75mm normal lens that came with the 645N is being replaced with a 55mm normal. No doubt optical enhancements for digital use are also part of the upgrade. Let me go back to my comparison table to show how this sensor size fits into the quality scale. Hmmm... the normal lens should really be 60mm. I guess Pentax are going with the tradition of issuing a slightly longer focal length than is truly "normal" for that frame size. In similar fashion we got 75mm instead of 70mm for 645 and 50mm instead of 43mm for 35mm. What can we expect from this camera? We have been told it will include a 31.4MP sensor, which is perhaps a better compromise than the 50MP packed into the Hasselblad. More pixels at a given size means more noise to contend with. A smaller megapixel count will cut down the cost as well. The form factor overall is similar to the 645N. It has the familiar bottom and side tripod mounts and an excellent sculpted grip. All the same metering, shooting and drive modes are here. Controls similar to other Pentax DSLRs are present: AF and AE-L buttons, dials for single or continuous AF modes, autofocus sensor pattern, exposure compensation, etc. 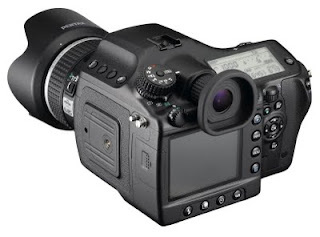 Notably there are front and back control dials, providing the same excellent ergonomics as the K10D, K20D and K-7. Extrapolating from early screenshots of the LCD, the maximum shutter speed is 1/4000s, up from 1/1000s and more in line with contemporary DSLRs. Innovations for medium format include the addition of Sv and TAv modes for sensitivity-priority shooting. There is no function button, like that found on previous digital SLRs, because every function has its own dedicated button: flash, white balance, image settings, ISO and so on. Even mirror lock-up. Compatibility with previous Pentax 645 lenses is maintained, plus Pentax 6x7 with an adapter. This is nice for those with a large collection of glass. The camera runs off a proprietary battery, not the AAs that powered the film version. Some mockups made it apparent that both SD and CF cards were supported, but it's not clear that this will be the case in the release model. In summary, this camera combines the best of the K20D with the 645 form factor. And does this mean the camera will in fact be available in the UK? Given Bunnell's announcement in New York, will the 645D also be issued in the USA? This evidence contradicts early talk from Pentax Japan, who said it would be for the Japanese market only. But if it is released worldwide at these price levels, it could create a major shock wave in the industry. The Hasselblad is 25 grand after all. In any case, Pentax seems committed to competing in the market segment they have traditionally occupied: low-price alternatives to first-class gear. Only time will tell how successful they are. In the meantime I'm familiarizing myself with my 645N. I'll be ready for digital medium format when it comes... and when I can afford it! I don't understand the comment about 55mm being in the tradition of longer than the diagonal normal lenses If the diagonal is 60mm, the 55 is shorter, not longer. In fact, I think the sensor will be just 30x40mm. Also, from the layout of button and dials, I'd say it is based over K-7, and not K20D. Thanks for catching that - brain glitch! good to hear a little more about this seemingle elusive equipment. You are talking about the specs of this camera as if it were real! This has been vaporware for FIVE, count 'em F I V E, YEARS! That's half a decade! Show me the Easter Bunny and Santa, only THEN will I believe in this never-was-and-never-will-be camera. The camera will be revealed in 17 days, on 11 March. Here is the Japanese teaser website. The Japanese site is now in English. The first units are in the hands of amazed users. I guess all the naysayers can go back where they came from now? As if I would ever steer my readers wrong!